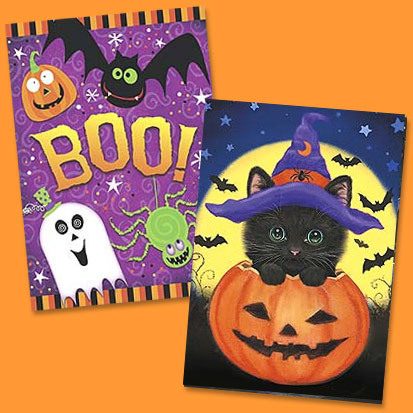 Share Halloween Fun with these Spook-tacular & Whimsical Cards! Wish your favorite goblins and tricksters a "Happy Halloween" or "Trick or Treat" with hauntingly great Halloween cards from Leanin' Tree! From whimsical witches & skeletons to ghosts & pumpkins, you'll find perfect Halloween cards for brewing up monster-sized grins! Choose from spooky or funny Halloween greetings, or create a one-of-a-kind Personalized Halloween Card with your photos and personalization. Celebrating a Halloween Birthday? Shop Halloween Birthday Cards and Party Invitations. Looking for ideas of what to write in your Halloween card?Browse our favorite Halloween jokes, quotes, and messages!